I'm a home organiser in York, member of APDO, and guest writer for Houzz. I love to help people regain their love for their home by sorting through their accumulated possessions and helping them to make decisions to reduce, recycle and release items that are no longer needed or loved. Providing support through the decluttering process and hopefully changing bad habits and unhelpful thought patterns along the way, I can also follow up your declutter with decorating and restyling your room to complete the transformation. Acastrian is a York-based bespoke carpentry company. We specialise in the design, manufacture and installation of bespoke fitted furniture directly to private households in the North of England. We are proud of our 100% customer satisfaction record and the peace of mind we give our clients. We project manage the entire process leaving you to watch your dreams become a reality. Home libraries, bookcases, media centres, fitted wardrobes, home studies, alcove units… we can help. You will not find any of our pieces in catalogues or in shops – and there’s a good reason for this. 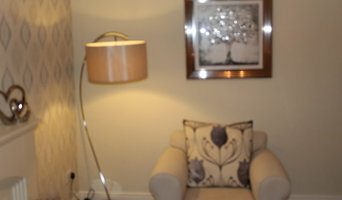 All of our work is individually designed and crafted to suit your exact requirements and style. We pride ourselves on our honed customer service and carpentry skills, and hope that you will give us the opportunity to turn your ideas into the piece of bespoke furniture you’ve dreamt of. 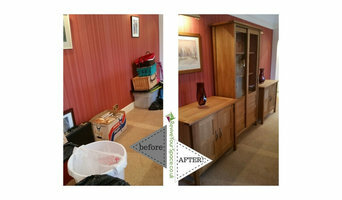 I offer a one to one decluttering and organising service for homes and offices. If you feel overwhelmed by clutter and don't know where to start to sort it out, I can help by providing practical and emotional support in order to clear the clutter effectively. I also assist you to put in place brilliant organisational systems to make your home or office run like clockwork. If you live outside of the Yorkshire area or can't commit to one on one sessions, I offer a Virtual Coaching course or one of telephone/skype sessions in order to assist you with decluttering and organising your life. Another often used service is the bespoke Home Organisation Handbook - a beautifully presented manual on how to declutter and organise your home, room by room. After discussion and/or a visit, this guide is drawn up and posted out to you. Please note, I am also a qualified Home Stager and offer a home staging and styling service to prepare homes for sale and rent. In addition, I offer assistance with moving house/unpacking. Due to demand from previous clients, I now offer a PA at home service. I can assist with any life admin task either on an ad hoc basis or as a regular occurrence (for example a few hours per week) I can provide the 25th hour in the day that you need. Please see www.atidymind.co.uk for more information on any of these services. Please don't hesitate to email at kate@atidymind.co.uk or call on 07961770452 and do bear in mind that I offer free assessment sessions. Impressions Mouldings are a Leeds based company, we manufacture GRP (rigid fibreglass) canopy tops, door surrounds and bow window canopy tops. We also do windows, doors, conservatories & all roof line products. 3d architectural visualization and rendering services guarantee to bring your building, remodelling or landscape ideas to life. Therefore, to ensure the best services in high-end 3D visuals and architectural visualization hire the services of the experienced agency. There are many DIY space saving storage solutions available on Houzz, but if your home is in need of more storage options than just a few shelves or drawer organisers, then you should consider hiring Leeds, West Yorkshire professional organisers or home storage designers. If you really struggle learning how to declutter, organise and get rid of the unnecessary, then a professional organiser or storage designer could really revolutionise your life as well as your home. What do Leeds, West Yorkshire professional organisers and storage designers do? A Leeds, West Yorkshire professional organiser can declutter your home and help you organise your possessions and furniture in a way that fits with your design vision. A home storage designer, on the other hand, can be hired to design custom wardrobes, shelves or other storage solutions to give you the exact storage space you need in your home. Some Leeds, West Yorkshire professional organisers will be able to coach you in how to declutter your life, as well as your home, so that you will learn how not to clutter or hoard anything in future. This is a great idea if your home is in need of a complete overhaul and you think that you have a problem with clutter and letting go of old possessions. Or, perhaps you have one particular room that has become overcrowded with clutter, such as the spare room, office or utility room, and needs some serious decluttering attention from a professional. Moving house is always a stressful time and can be made worse by having to deal with all the clutter, jumble and bits and bobs, so it could be worth hiring a professional organiser in Leeds, West Yorkshire to help you with your move and make sure your new home looks neat and tidy in no time. You can search for Leeds, West Yorkshire professional organisers with Houzz, see their previous projects and read reviews online before you contact them about your project. If you’re thinking of hiring a Leeds, West Yorkshire storage designer or professional organiser when moving into a new home, you may want them to discuss your design ideas with any other professionals working on your house project to make sure your storage solutions work with the rest of your design. Here are some related professionals and vendors to complement the work of home storage designers & professional organisers: Interior Designers, Furniture & Home Accessories, Design & Build. Find a professional Leeds, West Yorkshire professional organiser or storage designer on Houzz. Narrow your search in the Professionals section on Houzz to Leeds, West Yorkshire storage designers and organisers or look through storage and wardrobe photos and contact the professionals that worked on them.